Here are a few tips we offer our customers on how to maintain your new hardwood floor. Don't Damp Mop - Water and wood floors don't mix! 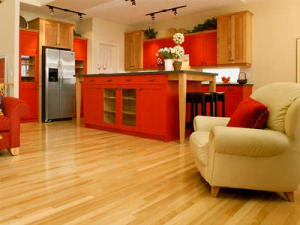 Use only the manufacturer's recommended cleaning products on your hardwood floor. New Construction - Many times the hardwood floors are installed prior to a new home being completed. If possible, lay heavy cardboard sheets or heavy paper down over your floors while workers are still in the house. Vacuum Regularly - Small stones, mud, and gritty dirt tracked in from outside can play havoc on the wood floors finish. To help combat this, use long bristle welcome mats placed at all outside entrances for people to wipe their feet on before entering onto the floors. Also, vacuum using a soft bristle brush attachment. Use the Proper Chair Glides - Narrow wheels and sharp wooden, or metal furniture legs can scratch and dent hardwood flooring, which can quickly turn a newly refinished floor into an old worn floor. Any furniture that rests directly on top of a hardwood floor should have felt protectors, or furniture coasters under all it's feet. For extremely heavy objects such as a piano, use rubber cups. We carry several types of floor protectors to help you protect your hardwood floor from becoming damaged by sliding furniture. Don't Use Oil Soaps - There are many over the counter oil soap based that can damage or dull the finish of your hardwood floor. The best suggestion is to only use the manufacturer's recommended cleaning products on your hardwood flooring. Never Wax a Urethane Floor - If you have a polyurethane finish on your hardwood floors you should never apply a wax. The wax may leave a sticky film on your floor which will attract and hold dirt. Always use the manufacturer's recommended polishes and cleaners. Wipe Spills Immediately - when accidents happen and some liquid gets spilled on your hardwood floor you should use a slightly damp white cloth, or paper towel to immediately clean up and dry the effected area. For more difficult spots, follow the manufacturer's recommended cleaning procedures.